How much does it cost you to fill the tank these days? Filling up the tank has never been cheap, but the cost of gas hit a three-year high across the country this week. According to GasBuddy.com, Montreal residents are paying the most for gas in Canada, with motorists coughing up an average of $1.53 per litre. Meanwhile, Vancouver residents are paying the second highest prices at $1.51 per litre, although many gas stations within the city limits were selling gas for $1.519 per litre this morning. Residents in Toronto were paying $1.40 per litre on average – a much more reasonable price that Vancouverites were also paying for just weeks earlier. Overall in Canada, prices are about 22 cents higher than what they were in April 2013. However, it is unlikely that prices will continue to soar any higher given that consumer tolerance has likely plateaued. Comparatively, Americans are only paying about $1.00 per litre and much of the differentiation can be accounted by higher fuel taxation in Canada, especially in Metro Vancouver. Where to fuel up with the lowest prices? VancouverGasPrices.com provides motorists with the latest gas prices at all of the city’s gas stations. The rates are frequently updated by its users. 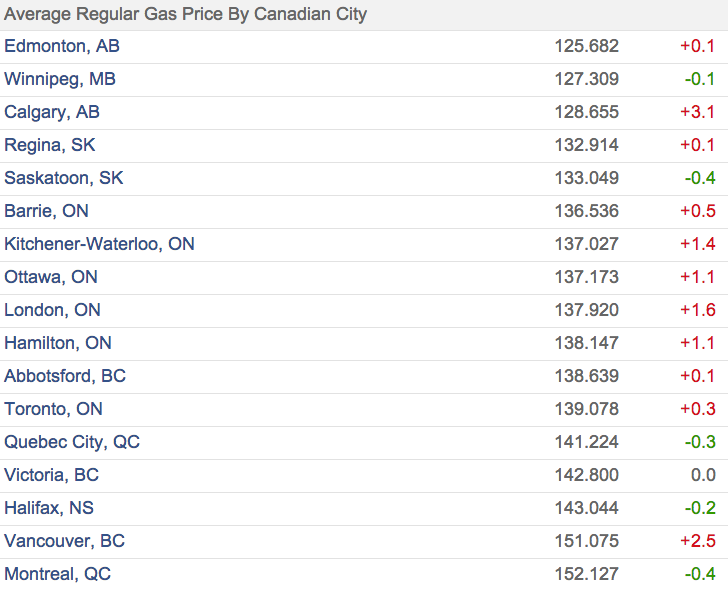 Generally, the gas stations with the lowest fuel prices are located in East Vancouver. Readers can also use the website to search for gas prices in Metro Vancouver’s suburban cities. Prices generally increase annually just before summer. Not only is there more demand for gas during fair and warmer weather, refineries also have a slower output during the start of this period as they are switching from winter to summertime fuel blends. This seasonal gas transition allows for the output of a summer-grade fuel that reduces smog and pollution during the summer ozone season. The downside to this more environmentally-friendly blend of fuel is that it costs more to produce than winter-grade gas. The global economy is beginning to see drastic upswings, shedding away from the lingering impact of the 2008 recession. There are also worries over the ongoing Ukraine crisis, which is expected to be a prolonged military conflict between Western allies and Russia. NATO-led sanctions against Russia and military drills in Europe could lead to disruptions in supplies from the world’s second largest oil exporter. The loonies’ price has been in decline against the U.S. dollar over the past year, falling 10 per cent over the last few months alone. As crude oil prices are set in U.S. dollars, Canadian refineries are paying more to make their product and the higher costs are passed on to consumers at the pumps. Lowered demand and higher crude price have caused three major refineries in Eastern Canada to close, resulting smaller supply output which causes higher prices. More refineries in North America are expected to close in the coming years.